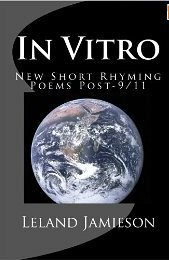 As in his earlier book, Twentieth Century Bread, in In Vitro: New Short Rhyming Poems Post-9/11, poet Leland Jamieson paints a vivid landscape using rhyme and diction. A formal poet by nature, his best efforts are tightly-crafted examples of form meeting function. With his verse, he explores childhood memories, extols the beauty of nature, and contemplates the history of human life on earth. too cool at core to dance the night’s short haul. volcanic cones upon a sea of snow. in restaurants talked so little during meals. on us. It’s hard to hear. No topic is too small — or too lofty — for Jamieson, who is equally comfortable examining shells or pondering the celestial origins of humans. As he did in 20th Century Bread, he includes several poems about the Anunnaki space travelers who, according to an ancient Sumerian manuscript, influenced life on Earth. In this collection, however, he does a better job of explaining the sources for these stories, in the notes at the back of the book. Perhaps, in order to make that series of poems more accessible for those who fail to read the notes, such a plain retelling needs to appear in a poem, as well. Overall, Jamieson’s collection is a thoughtful, careful examination both of one person’s life experiences and about the nature of life experiences in general.